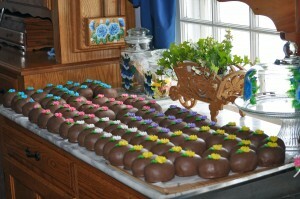 Homemade Chocolate Crunch Easter "Eggs"
Preheat the oven to 325, and spread the coconut on a small baking sheet. Bake until the coconut is golden brown, stirring after every 2 minutes to prevent browning. Place the toasted coconut in a bowl along with 1 cup of the graham cracker crumbs, and 1.5 cups of powdered sugar. Stop the mixer and add the peanut butter, melted butter, vanilla, and salt. Turn the mixer to low and mix until the candy is well-mixed. Add the remaining powdered sugar 1 /2 cup at a time, adding just enough to make the candy firm enough to shape into balls, but not so much that it becomes dry and crumbly. Using a spoon, scoop up a small amount of candy and roll it between your hands until it is an egg shape. Place it on a baking sheet lined with aluminum foil and repeat with remaining candy until you have approximately twenty eggs. Put the eggs in a cool place (a refrigerator will work) to stay firm while you melt the chocolate candy coating. Place the chocolate in a saucepan ( microwave-safe bowl and microwave until melted) stirring after every minute to prevent overheating. Once the chocolate is melted, dip the eggs in the chocolate and replace them on the foil-covered sheet. While the chocolate is still wet, sprinkle the tops of the eggs with the remaining crushed graham cracker crumbs. Refrigerate for 30 minutes to set the chocolate. Crunchy Easter Eggs can be stored in a cool cellar or the refrigerator in an airtight container for up to a week.